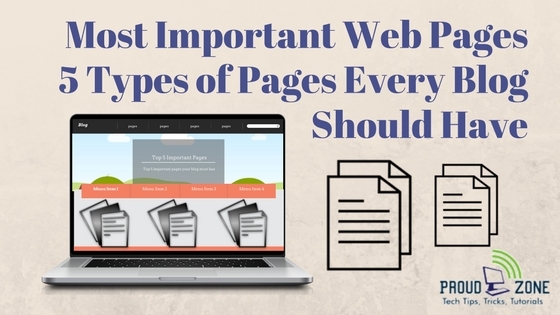 There are many reasons why you must have significant pages on your blog or website. If your blog is old enough and meant to generate revenue or if you are about creating a new money making niche blog, there are quite a good number of pages you must create to give out specific information about your blog and also to gain the trust of your readers, so that you could gain more loyal traffic. While these pages are all important, 5 of them are more crucial. These are more strategic in helping you generate more income and earning more trust for you from your community. So, after setting up your blog, your next goal is to create contents. The content of your blog will be the bait that attracts your readers. Without a great content, even the most well-designed, tightly-structured blog will ultimately fail. There are three types of content you need to create for your blog. Before you start writing your day-to-day “Blog posts” you will want to make sure the static “Pages” and “Sidebar” content of your blog is created and uploaded to your blog. Let’s explore each of these content areas. To help yourself with a little liability protection, you might want to consider a disclaimers page. For example, if you are writing a programming blog, but you’re not a professional programmer, you may want to create a disclaimer to say that you are not a programmer and recommend that readers must another coder/ programmer in case any big issue. You may also want to inform visitors to your website that you use analytics tracking, Google AdSense, affiliate marketing links and other types of content. A great example of a disclaimer page can be found here. Here’s the example of a Disclaimer page. • Billing and shipping address. A sitemap page plays an important role on blogs as it allows readers to find any page within your site quickly. An HTML sitemap also represents a very efficient way to distribute your link among the pages of your site. Here’s the example of a Sitemap Page. The most traditional page on any blog is the About page. This page simply tells new visitors to your blog what it is about, who you are and why you have a blog about your specific topic. Depending on your niche and your style, the information you provide can be “all business” or personal and fun. Having your photo with a blurb of text helps visitors put a face to the blog, whether you are the owner and editor managing other writers, or the main content author. Here’s the example of an About Us or About Author Page. This page enables visitors to your blog to contact you at any time. It can be a simple page with your email address plus social network links or you can use online contact form creator tools such as Google forms to have a contact form visitors can use to contact you without leaving your website. If you created your blog to promote your business, you’ll want to make sure there’s a page that details the products or services you sell. Alternatively, if you already have a website for your business, you can provide a link to it in your menu. Here’s the example of a Contact Us Page. Your sidebar is the smaller column to the left or right (depending on the theme you selected) of your blog’s main content. You will want to add the following content in sidebar widgets for your visitors. Such as, popular posts widget, recent posts widget, trending posts widget, etc. Encourage visitors to your blog to subscribe via email or RSS. Email, of course, is best, especially if you would like to monetize your blog in the future. These 5 pages are the keys to gain the trust of your readers, to generate income and also to increase your potential customers. If you create great content but you don’t have these important pages on your site, your readers will probably start leaving your site. But if you do create these pages once, your audience will know more you, so that they can trust you and never leave your site again. Thank you for reading these post. If you like it, do share it with your friends and family members.